As a kid, waiting in line for your favorite ride at a theme park was always a real pain. But in the end, there's something about the wait that makes the ride even better. Anticipation of the adrenaline rush and all the fun you were about to have would build as you crept closer and closer to the front. Your palms would start to sweat and your heart would beat a little faster until finally you were there! 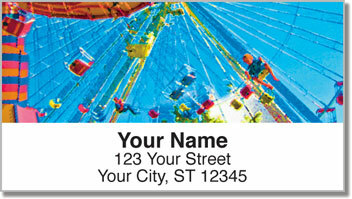 Amusement Park Address Labels capture the pure joy of carousels, Ferris wheels and roller coasters with four colorful images! And there's no height requirement to use these fun labels. 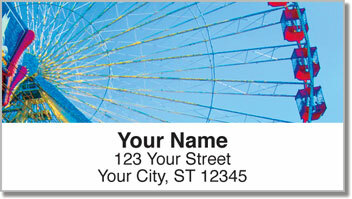 Stick them on all your outgoing mail for an easy way to finish off each envelope. 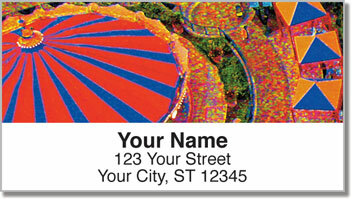 No more scribbling your name and address - just peel and place! 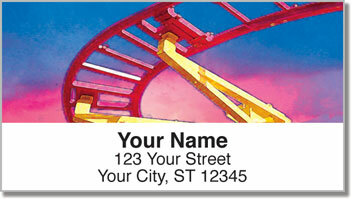 Order Amusement Park Address Labels right now! Get them with matching personal checks.